I mentioned in a book haul not long ago that I was asked to be part of the blog tour for the next installment in George O'Connor's Olympians series, Ares, and that when I said yes (yay, mythology! ), the fine folks at FirstSecond not only sent me that book, but the entire boxed set — further cementing that they are amazeballs. And yes, I still said amazeballs in 2015. Now, the reason for this (beyond said amazeballs), I'd imagine, is that I expressed a little trepidation at jumping into the series at book 7. Though I know it's a retelling of Greek myths, I wasn't sure what kind of retelling it'd be; so though I'm very familiar with Greek mythology, that's not to say that I'd be familiar with O'Connor's spin. I mean, Kendare Blake's Antigoddess is fabulous, but it's hardly a traditional retelling; same: Percy Jackson; same: everything else out there. But I needn't have worried — there's no spin! I mean, that's not to say there's no interpretation, or picking and choosing which aspects of which tales to highlight, because of course there is. But the series is more like careful curation; it presents these timeless stories just as they've always been, but in the fantastic modern medium of the graphic novel. It's faithful, but playful. And this may be weird to say, but it's kinda ballsy. In a time when everyone's looking to bank on their own twist of the well-known, it's refreshing to see someone say, Nope, these stories have stood the test of time for millennia now, so I'd much rather give you an excellent presentation of them than a modern, watered-down version*. *She says, fully loving the "modern, watered-down versions" too. I'll take 'em any way I can get 'em. But beyond the faithfulness and clarity of the presentation, I would have fallen in love with (and have fallen in love with) the artistic and narrative choices O'Connor makes. I had a feeling from almost the first moment of Zeus that I was going to love these (and I say first moment, but actually I think it was literally the first, nearly-blank page, that gave me the love-this feeling); little touches like this recurring thematic thread (right) of having 'too much of his father in him' cemented it. Which means by page 10, I was in love. 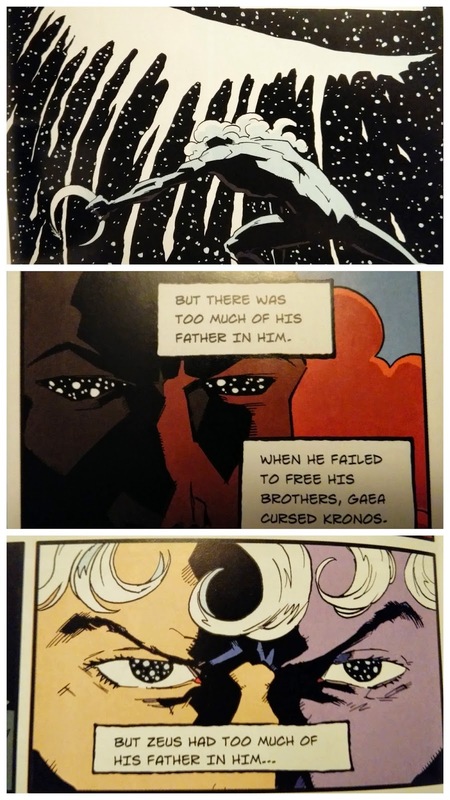 This example might seem a little silly or meaningless to some of you, but it struck me for a few reasons: 1) it's a solid storytelling & artistic choice, to have the "father" (the stars) physically represented as being a part of Kronos and Zeus, 2) it's a striking image, and 3) it so perfectly and simply encapsulates the core of these myths, and how its actors are doomed to repeat the mistakes that came before them. So many Greek myths are about inescapable-ness and self-fulfilling prophecies, and to succinctly and strikingly capture that aspect so simply basically immediately won me over. But whether those little details are likely to win you over or not, the fact remains that this is a very strong adaptation of Greek mythology, both in the art and the storytelling, and I highly recommend them. You can find out more about the series (and the gods!) here, and take a peek inside the books, and you can catch the rest of the Ares tour here! I was always fascinated by mythology. This graphic book set totally peaks my interest. It has been some time since I haven't read more than a retelling or variation on a Greek mythology story. This series sounds awesome! And I appreciate that as a reader I can start with any volume and not be lost :) I'm not as well versed as I want to be in either Greek or Roman mythology but my favorite stories are Persephone and Hades & Cupid and Psyche.